The Robie Pierce One-Design and Women’s Invitational Regattas have become two of the premier adaptive regattas in the U.S. since their inception. 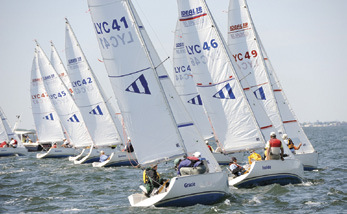 Run jointly by the Larchmont and American Yacht Clubs, the Robie Pierce Regattas represent the largest one-design events for sailors with disabilities in the country. The Robie Pierce Regattas are sailed in specially adapted Ideal 18s provided by the host clubs and, as needed, by neighboring clubs with Ideal 18 fleets. This year’s Robie Pierce Regattas will return to Larchmont Yacht Club, with registrations pointing to more than 20 boats on the starting line. Racing as pairs, sailors enjoy the assistance and added security of having an able-bodied sailor on board to perform functions the sailors are unable to do themselves. This year, the Robie Pierce One- Design will be in its sixth year and will run May 30 – June 1. The Robie Pierce Women’s Invitational – the world’s only all-female adaptive regatta – will be sailed for the fourth time on May 29. Past regattas have attracted Paralympic sailors from both the U.S. and Canada, have included Maureen McKinnon, Gold medalist at the 2008 Games, and Jen French, Silver medalist at the 2012 Games and 2012 Rolex Yachtswoman of the Year. The Robie Pierce Regattas seek to be inclusive so they can touch as many people as possible. For some, this is the only time they get to “leave their wheelchair behind.” Once they’ve left the dock they are…well…just sailors. Again this year, the Robie Pierce Regattas will include sailors ranging from paraplegics and quadriplegics, to stroke survivors and people who are blind or visually impaired. Anyone interested in sailing in either of the Robie Pierce Regattas should visit RobiePierceOneDesignRegatta.com to learn more about this truly inspiring event and find committee contact information. The Robie Pierce Regattas would not be possible without the generous support of Heineken U.S.A., Mercedes Benz of New Rochelle, Green Mountain Coffee Roasters, Lucerne Capital Management, Magnum Bars, and the Sailing Foundation of New York.